DIY SEO Tools in Our Pro SEO Platform – Get Access to the best SEO Tools for Just $2! Expert Search Engine Optimization More than pays for itself, our SEO platform is routed in years of real world experience, significant ongoing financial investment and continual development. Built by SEO experts for Search Engine Optimization Projects and now it’s available to you for a nominal fee! Please be under no illusion that what we offer is a true professional grade SEO platform that is far more powerful and effective than the usual consumer grade “SEO Tools” that abound for far higher prices, you will be amazed by our monthly plans which start at just $14.99. In addition to offering access to our SEO platform we also have our own SEO experts to provide a full SEO Consultancy Service. LocalAdworks offers a range of complimentary digital marketing services such as Web Design, Conversion Rate Optimization, On-line Marketing. DIY SEO Customers Can Access Our Complete SEO guide, It’s easy top follow because it’s written especially for our SEO platform a detailed step by step expert White Hat SEO guide – No Previous Experience is Necessary! Finding and fixing errors on your site, building links, discover exactly how your competitors are achieving success, building links, growing business with Social media, monitoring your progress and much more! "Fly through tasks that used to take ages to do manually, having everything built into one application means the tools can talk to each other, making them even more useful. You find that no longer having to jump between several different programs also saves a lot of time - sometimes I wouldn't have the time to do the work if I did not have these tools"
"What I like best about the Rank reporting system is that you can see where you rank for a keyword AND the competition for that keyword so that you can begin to build a picture of where you would EXPECT to rank for any new keyword term that you introduce. This is as close as you are going to get to being able to judge which keywords you can invest time & money introducing into your site!" "I normally do not endorse products. However we use this all day and most days and to great effect. This product can be used by both your client and marketing firm. It's a must have in this competitive industry. The service uses ASP to remain updated.One of the key aspects was how the research tools, and website maintenance tools complemented each other. This is simple, elegant and easy for all to use." "Once you get this program, you can bid good-bye to most of the other programs that you may have used or tried earlier - you won't need them anymore"
The Keywords tool produces and suggests much more than my previous expensive tool that it’s worth the admittance fee on this feature alone but that's just the start there's so much more!" "After only 40 days I am in the first page of google!" "We spent days comparing Internet marketing software to find a robust tool with the ability to provide our clients with automatic branded reports and we are very glad we did! The product is excellent and our customers love what we can now provide. It has allowed us to automate and organize a lot of our SEM tasks and use the time saved to improve service, highly recommended"
"It's so refreshing to happen upon a product that actually does what it is meant to and in a clean and professional way..This software has made the job 100% easier and far more effective"
"Having used many SEO tools in previous years using assorted suppliers was proving to be inefficient. We evaluated many alternative suppliers and settled on this as the most efficient and comprehensive package available. Each of the tools more than hold their own compared to the previous individual tools we used, many are the best I've ever used. I recommend this to any SEO consultant, marketing agency or individual business who needs top notch SEO tools & results." "Extremely well thought out program that uses simple logic to help you move through the processes of optimizing your site. If you're serious about obtaining and maintaining high rankings in the search engines then this software program is the top choice for you"
"A wonderful resource and is also a great tool for beginners in the web marketing world who want to catch up the competition or start learning the basics of SEO at a very affordable price"
"An excellent range of extremely useful and powerful modules that cover all areas of website marketing." "Finally a program designed to help you optimize and maintain your search engine status in a highly user friendly environment"
"By far the most powerful and easy to use SEO software available......demystifies the entire SEO process and is the foundation of my organic SEO consulting. With just a few clicks I learn exactly what customers need to get top rankings on the major search engines"
The Localadworks SEO platform intelligently integrates over 20 professional grade SEO tools that include everything you need to grow your business online. Forget about the hassle of installing & maintaining resource hungry inferior desktop tools, our services are all cloud based, always up to date and always available on any device that you use. They include all the tools you need for SEO and for local citations accessed by over 200 million monthly searches via the world’s biggest partners, effective niche keyword research, technical website audits, on-page website optimization, backlink analysis, link building, detailed competitor analysis, marketing analytics, social media metrics, enriched citations and more. Whatever your situation we have a service that will solve your problem. This is as close to a “Magic Bullet” as it gets! “Make it Happen” The Easy Way! Localadworks is proud to be the trusted supplier of online marketing services to a number of high end marketing agencies. Now for the first time we have made the exact same platform and staff available to end users. In addition we have created a range of affordable SEO packages to suit all budgets from the smallest start up website to the largest multinational there are SEO Plans available that include access to the same platform as used for multi-million dollar companies. Our Budget SEO Services are fully supported, customers selecting one of our famous DIY SEO packages (previously called the “Self-Service SEO Plan”) can use our easy to follow, detailed White Hat SEO guide, it is especially written for our SEO platform and integrates perfectly with all of the SEO tools that you will have access to! In addition to our Self service SEO Packages We also offer a range of premium Full Managed SEO Services with no compromises! All of experience and our class leading platform are focussed on getting results for you. The optimization service is delivered by our own highly experienced SEO experts and as a client you have full access to the platform. Unlike other companies we don’t just say we have done the work, we can show you the work and the results, see our Managed SEO Services for more details. We can configure and Produce Professional SEO Reports with your own brand as required for, your customers, colleagues, investors and other stakeholders. You Choose how much detail to include in reports and what is included in summaries of each section. We can set up your personal reporting on your own dashboard choose dates for reports to update automatically and choose the same or different dates to automatically email reports on schedule to the recipients that you choose. Run a on-page SEO audit of your site and get a detailed clickable report on all SEO issues; then follow the easy tips to fix them all. Perform a detailed SEO audit of your site and each page to make it all Google Panda and Hummingbird friendly. Mobile is a huge ranking factor, 2016 was the first year that most browsing sessions were mobile! Run checks on your site for mobile friendliness and make them all mobile friendly now. Tools of a Professional standard demand reporting capabilities to match, that’s why our reports can be configured by you, exactly how you like them. To rank well in the search engine results you need to perform audits and fix all on-page SEO issues, not only that but as your site grows, develops and time passes you will need to perform regular SEO Site Audits to ensure that your website is still Google, Bing, Yahoo and other search engine friendly. A few examples are that page URLs do not contain invalid characters, the Robots.txt file and XML sitemap are in place, your TITLEs and Description tags are unique and much much more. Compare pages of your own site against for SEO, to help you focus on the best ROI: identify the SEO score of each landing page and the specific SEO issues found, Google mobile friendliness and page speed score, page average ranking position on Google, the volume of visitor traffic this page has delivered over the previous days, and more. Landing Pages are so important, get a detailed SEO report on each one so that you can optimize it, identify all the critical issues, learn about them and use the SEO tips given to avoid a Google penalty and fix them. Easily perform a detailed check of every landing page for valid URL structure, mobile and tablet friendliness, Schema markup and Open Graph markup, and much more. Site visitors don’t like waiting, so neither do Google, Bing or any other search engine, page speed is a ranking factor. Check that your pages load quickly enough. Our Page Speed Test will check how fast your page is loading, identify what is slowing it down and give easy practical guidance on how to fix any issues and make the page faster. Identify mobile SEO issues that may influence how well your site does in search engine rankings for mobile search then get recommendations on how to fix them. Remember Mobile is the main platform now, Don’t leave money on the table! then be sure to track your mobile rankings directly with Local Adworks’s Rank Checker tool. View and click the SEO reports provided by the Local Adworks SEO Analysis tool, open the “Critical issues” and “Consider fixing” sections. Simply click on an SEO issue to expand it’s description and then click on the “How to fix” button; you’ll find detailed easy-to-follow instructions, no previous SEO experience is required. The SEO Analysis tool uses keywords directly from the Keyword Research Tool, you can easily save your favourite keywords found and then choose which to use in various reports turning them on or off with a click to easily assign previously analyzed keywords for each landing page that you optimize. It’s difficult to overstate the importance of the SEO road map, without doubt the humble map is the most important single asset to most site owners because the SEO world is large, it can be confusing, it has risks for the uninformed and huge rewards for the well informed. One final thing it is also ever changing too. What we hear time and time again from our new customers is that they had enthusiasm and intention but that it gave way to confusion, frustration, resignation and an illogical hope that quality traffic will “just happen eventually”, but once they join us they are amazed at how simple it can be, just Follow the Map”. Don’t waste time reinventing the wheel or waiting for luck, or doing theoretical research! Instead do something Proven, Practical and Productive and do it now! Build your own Online Marketing strategy with a detailed step-by-step DIY SEO road map, update your progress with our interactive checklist, apply the power of our platform to your own website with Local Adworks. Get a detailed Technical SEO Report about errors like broken links, missing anchors, server issues, and much more. These issues harm your search engine rankings all the time they are there; get advice on how to fix them immediately. Check your site for harmful usability issues like dead links, missing pages, missing images, slow pages, and more. that are costing your business money now; get easy to follow guidance on how to solve the problems. 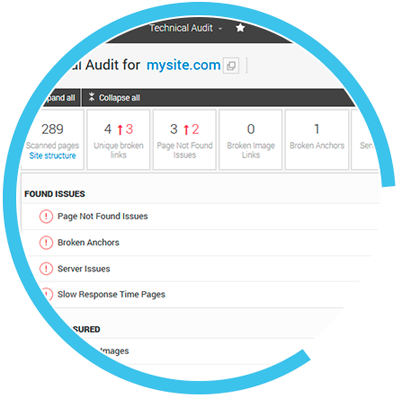 Provide professional quality technical SEO site audit reports to your customers and stakeholders. Have Local Adworks analyze every page of your site and produce a detailed report on all possible technical errors such as missing tags, broken links, broken anchors, server problems and page-not-found errors. Run regular website usability checks to quickly spot and fix harmful site issues like slow page load times, mobile failure, missing images or pages. Simply hover your cursor over a question mark next to a technical error or issue found on your site; to access simple practical guidance on how to fix each issue. Maximise efficiency by automating your On-page SEO Checker with Local Adworks, enjoy optimum site performance without usability issues or serious code errors that will negatively affect your search engine rankings. Use our detailed step by step SEO Roadmap which compliments our SEO tools to apply an integrated approach to your website promotion, maintenance and performance analysis. Only subscribed customers can access our full detailed interactive roadmap. Produce technical SEO audit reports Branded with your own logo and corporate colors; provide them to your own clients, investors, Directors and other stakeholders on a schedule that you set. Start Now! Check your site for the On-Page SEO Issues that are costing you money right now! When you properly optimize your website for the right keywords your pages will rank higher and attract more traffic, the benefit to you is multiplied because at the same time you will attract higher quality traffic with a greater probability of conversion. Once you have “the formula” you can simply repeat it with new keywords to drive even more business and use our platform to improve conversion rates even further. Do all the right things and don’t put a foot wrong when promoting brand awareness. Get the best support and advice on how to promote your business online, easy access to the greatest and latest techniques without expensive consultants. With LocalAdworks you get everything you need to become an expert in SEO; structure, the best SEO tools, guidance you can rely on, up to date SEO techniques to apply and gain “real world” practical experience. With our SEO platform you can get complete guidance on each stage of the SEO process, beginning with the basics of keyword research, on-page optimization, content promotion, link building and online reputation management and beyond to mastery of SEO. Learn how to perform keyword research with a range of methods and how to build keyword lists to match your strategy, hone and refine keyword lists to identify effectiveness and improve performance. After doing the hard work of adding content or on-page optimization promote your freshly optimized content to your potential customers using our submission tools. Promote to millions of visitors via search engines, internet directories, press-releases to the biggest publishing networks in the world, promote media like videos and photos to specialtst sites and more. We are continually adding to our list of publishing networks and include major global and local networks, many your competitors even wont be aware off but their importance will give you a real competitive advantage. Gaining traction and growing engagement with a blog is notoriously hard, make it easier by doing the right things. Even if your blog is secondary content to your main site remember the purpose of the Blog is to provide fresh content and drive engagement so use our blogging SEO checklist to promote it in the best possible way and maximise the benefits of your work. Use our SEO training checklist for paid advertising techniques like Google Adsense and others, on-site and on-network advertising methods, mobile advertising, email marketing and affiliate marketing can also be used as elements of the marketing mix and are important categories of paid advertising in online marketing. Understand how Search engine marketing can work with Search engine optimization and how to evaluate the relative returns, the differences between them, when and how to use each. Improve visibility and generate more income. Our SEO roadmap, checklists and member content gives you clear advice on how to optimize website content and improve the website structure for SEO purposes so your site is both visible to search engines and also clearly understood by them too. Don’t be put off by the chequered reputation of backlinks in SEO, it is still hugely beneficial, you just need to be sure that you do it the right way. Done correctly link building can transform your business. Our materials and SEO checklist will guide you through this critical element of online promotion and help you to fix any old or new problems too. 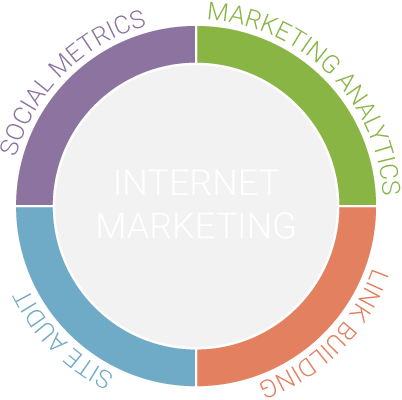 Your aim is to continually build the optimal backlink profile of high quality links. You will discover about creating link bait, about using social media channels, and how to promote your link worthy content to the right audiences. Our SEO training plan features the latest approved best practice techniques for social media optimization and promotion across channels. Social media channels are rapidly evolving use our always up to date techniques for website promotion with social media, like the proper way to work with Facebook, Twitter, Google+, LinkedIn, Pinterest, Quora, Community Answers, news and more. don’t waste time, start reaching new customers today! Find hidden gems and unlimited keyword suggestions for your niche, analyze their keyword effectiveness by volume and competition to build your keyword list. Easily find which keywords your competitors are already using, use the information to inform your keyword strategy by competing, using LSI alternatives or avoiding them and add the most effective ones to your own keyword favourites lists. Work efficiently, don’t waste time copying & pasting, from multiple SEO tools. Have easy access automatically to find and use the keywords you select in other Local Adworks tools, including Rank Checker and SEO Auditor, included in our platform at no additional cost. Searches begin with words and our keyword tool is one of the best available. Keywords are the cornerstone and with our tool you can access literally thousands of keyword suggestions for site content and on-page SEO. Identify masses of long-tail keywords and sort them according to effectiveness. Use the KEI rating (keyword effectiveness index), unlike other keyword tools you can evaluate keywords on global OR LOCAL monthly searches (tip. that’s a huge competitive advantage right there!) and evaluate keywords by other significant metrics as well to hone your keyword list and strategies. 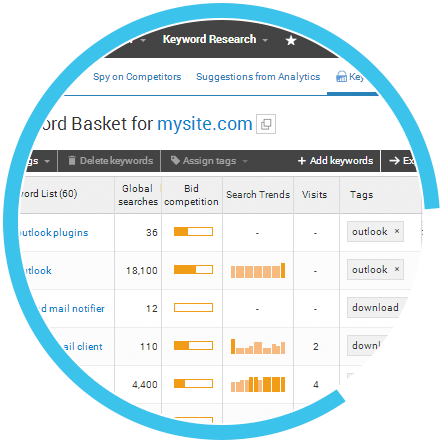 Discover what Keyword are working for your competitors with the Keyword Spy Module tools; use them as extra keyword suggestions in your armoury or ones to avoid wasting resource on and build a winning keyword list fast. You will often hear of finding overlooked keywords, high traffic & low competition hidden gems, but how do you find what you don’t know? They could be long-tail keywords you haven’t thought of, different terms with the same meaning that can bring lots of quality site traffic. Use the Google Search Console tab in Local Adworks Keyword Tool and find all these keywords fast and add them to your keyword basket to use now or later. To be successful you will need to continue building your list of keywords and keyphrases. As your keyword resource gets larger the ability to organise them and access them efficiently becomes more important too. Our platform enable you to use tags to segment your keyword lists and your keyword basket. You choose and allocate the tags and they are available for you to use in other Local Adworks tools like the Rank Checker or SEO Analysis tool. Imagine if all of your time was productive? Don’t waste time accessing multiple sources from a dozens of separate logins, evaluating alternative suggestions or paying for multiple tools that duplicate functions and confound productive action. Our Keyword Research tool will identify intelligent keyword suggestions from all these sources quickly, effectively, easily and then will help you to make effective decisions. Are you wondering where to start with Local SEO keywords? Simply select “Settings” on the top right of the Local Adworks Keyword tool, select your target country and language: it’s as simple as that you’re on your way to finding the keywords that you need to be succesful! Once ready with a keyword list, use these keywords in Local Adworks SEO Analysis tool to optimize your landing pages for higher page rank on for more searches. You’ll also see these keywords in the Rank Checker tool – to track your keyword rankings on 370+ global and local search engines. Build PDF reports of a Professional standard on your keyword research and strategy. Share reporting with your colleagues, clients and other stakeholders. 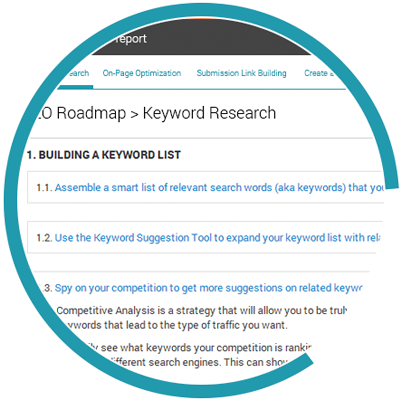 See an example report on Keyword Research by simply downloading anytime. and lay the foundations for successful online advertising with the best keywords! Get the key data on your traffic volume and pinpoint the sources, visitor demographics and behavior, monitor goals completed and more. Merge Analysis of customer data with SEO performance metrics for the best of breed marketing analytics. Use Competitor SEO Spy tools to gain insight into your competitors’ traffic data (powered by Compete and Alexa), understand their strengths, weaknesses and strategies, to inform your approach then monitor your progress against them. Save time and work efficiently: connect your Local Adworks account to all your different Google Analytics accounts for your own websites and your client websites. Access all the web analytics reports you need from a single robust location. Presentation matters! Match the quality of your service with reporting that is used by Professional Marketing Companies, then brand it with your company identity. Without Google authorization traffic data for competitors must be fed from “second sources”. Local Adworks aggregates data from the best sources in the world Compete and Alexa so that you can measure your performance against any competitors that you want. Make things simple, work efficiently and use the time you save to be productive and add value to your digital assets, you can get access to Google data in our platform with just a few clicks, it takes seconds! Traffic metrics and competitor analysis are cornerstones of your commercial strategy. Our platform enables clients to produce impressive professional analysis with incisive data, branded with your own identity, reports can be automatically updated & delivered on a timetable that you set to recipients that you choose. Numbers, Numbers, Numbers! Forget trial and error, analysis is the key to success! Set a schedule to check your site rankings on 365+ global and local search engines. Local businesses can miss a trick using global or national data, with Local Adworks you can check your Local Rank Tracker to get accurate local SEO ranking data for potential customers your own area. Get the competitive edge that the marketing Pro’s have! There are different types of search result and with our platform you can Track ALL rankings, organic search results, adverts, and vertical listings (Videos, Images, Maps, News and more). Monitor Mobile Rankings versus Desktop Search Results. In 2016 Most searches will be on mobiles! Customers can’t believe it but when they take action they gain a huge boost, with our platform you can track your website rankings on mobile devices and on desktop too, don’t miss an easy trick. What's in the Local Adworks Rank Checker Tool? With the Local Adworks Rank Checker Tool, you’ll now be able to check keyword rankings on more than 365 of the biggest search engines, for billions of searches, the names include all the ones you expect like Google, Bing, Yahoo, Goo, Voila, Seznam, Baidu, Rediff, and more that are important for traffic and for SEO, it’s truly Go Pro Marketing! Mobile searches will now represent more half of all searches! Mobile is huge and being ranked on mobile devices is a critical success factor. Set the Local Adworks Rank Tracker Tool to monitor Desktop and Mobile rankings: under “settings” and then add the mobile versions of the search engines that you are targetting. With the Local Adworks rank checker you can set rank checks to run automatically: Rank checks can be run on the dates that suit you, all dates are available but the amount of rank checks permitted varies according to the subscription plan) SEO rank checking is a system resource and data intensive process the ability to run it automatically means that you save time and can have the information available when you need it, prepare and even send reports all automatically too. You may feel like you are some way of needing this but trust us, when you get there the difference between selling or not selling can be down to your keyword ranks, your are going to want to know when something happens that will hurt your site traffic so you can fix it right away. Our email alert system is configurable so you can be sure it only triggers when you need it, find out if one of your keywords lost its #1 position, or if keyword loses more than a specified number of rank positions, get notified if your competitors’ keyword rank icreased, and much more, it’s like your own dedicated rank watchdog! Google updates it’s search engine algorithm regularly, they can seriously hurt your site traffic and your competitors too. We make sure you can manage that risk immediately and even turn the threat into an opportunity. Our platform automatically tracks Google updates and marks them on graphs, then when you see changes in traffic whether your own or competitors you can act fast and get the competitive edge. See the algorithm updates on Rank Tracking and Web Analytics graphs and check their effect. Once you analyse keywords with the Local Adworks Keyword Research Tool, you can then filter keywords by the tags allocated and use them efficiently in the Rank Checker tool to check how your site ranks for each. Ranking in search engine results is critical to success in SEO and there are a multitude of things you can do to improve rank. What you need is our actionable detailed SEO checklist to keep track of what has been done and what can still be done, that’s exactly what our SEO Rank checklist does for you! Access it from the Site Dashboard, subscribed customers have access to the premium versions of checklists that will keep you on track – highly recommended! Because Google has introduced Universal Search sometime referred to as “blended search”, it’s become crucial to monitor ALL blended search results which include paid adverts and vertical listings like Videos, Images, Maps, News and more). Enable this option in the Rank Checker settings menu > “Paid & Vertical Results” tab. If you are a local business what matters is how your site ranks in the local area not the entire country or world. Local Businesses need local data! With our platform you can check how your website ranks locally, like your local potential customers do. You can choose your ranking data to be based on your city, state, country or on a global basis. Simply select the Local Adworks Rank Checker settings and set the ranking location that suits your business. This function is not available in most other SEO platforms, but without our local SEO rank checker it’s a bit like trying to navigate to a street using an atlas! Marketing Professionals know that YouTube is now the second largest search engine in the world! They know they can’t afford to ignore that and neither should you. Remember as well that Google and other search engines LOVE multimedia, you should have pictures and videos on your site, and if you have videos on your site get them on Youtube too. Don’t worry if you are camera shy, you absolutely do not have to go on camera yourself! It’s important to use Youtube as part of your SEO strategy and gain YouTube rankings. If you want to gain big from the second biggest search engine then with our platform you can now add YouTube.com as a separate search engine in your Local Adworks Rank Checker settings, that’s huge! Often customers wonder how their competitors seem to be going from strength to strength, expanding premises, better equipment, more staff why they seem to be everywhere! What you need is knowledge, information, intelligence on why and how they are succeeding. The LocalAdworks platform includes a number of tools to help with this, our Competitor Rank Spy is just one of these tools. It allows you to see the keywords that your competitors are ranking for, if they have higher search engine rank for keywords that you are targeting and the relative value of the keywords too. It is simple to use simply add the competitor’s URL and get the information you need to pick apart the secrets of their success to help you establish your strategy. Tip: Simply navigate to the Competitor SEO Metrics Module of the Local Adworks toolset to find this report. Get the big picture on your site’s ranking performance trends over time. Utilize the Rank Checker Dashboard and related widgets to show your site’s Average Ranking Positions vs. Competitors, Ranking Distribution data, Ranking Position Changes and more. Produce SEO Keyword Ranking reports of a Professional standard in PDF format. Build and reinforce your own brand by branding them with your logo, slogans, headers, footers and corporate colors too. get organized and check your website rankings now! + See Where Your Competitors Are Outranking You Assess the visibility of your competitors’ sites then develop your own marketing strategy. Compare competitor rank to your own, easily identify the keywords and site pages that you need to prioritize with your immediate attention for the maximum benefits. + Competitor Link Spy: A Complete Comparison of Your Link Profile Versus Your Competitors The number and quality of backlinks is immensely important, getting it right is not simple and can be a lot of work, remember strong competitors may have built up their profile over years when things were different. Our tools give you back the competitive edge and are literally and huge benefit that means the battle is half won! 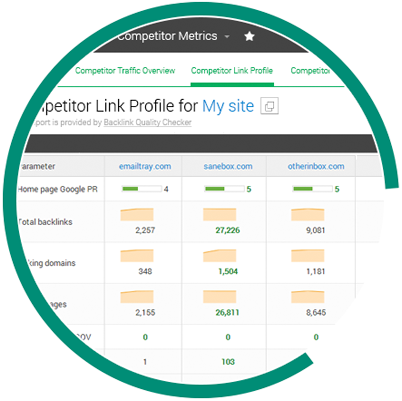 Compare your site link for link with competitors, use important off-page backlink metrics, instantly generate sources for the new links that you need and be able to prioritize them based on quality and value. + Estimate Your Competitors Site Traffic Get traffic metrics for your site like unique visitors and Alexa Global Traffic Rank History and competitor sites for the last year. Use our Competitive Analysis Checklist to learn which key competitor metrics you should analyze to improve your site and benchmark against to monitor performance. Our “Off the Peg” plans allow you to compare ranks against up to 20 competitors, we can set up custom packages for even more if needed! Assess your competitors with our full ranking report, assess your visibility and identify who you need to take a closer look at, talk about growth hacks! Assess the strength and source of competitors’ off-page optimization and compare their key metrics to your site, identify new backlink opportunities in seconds and segment them according to SEO value, page rank, page authority and domain value. 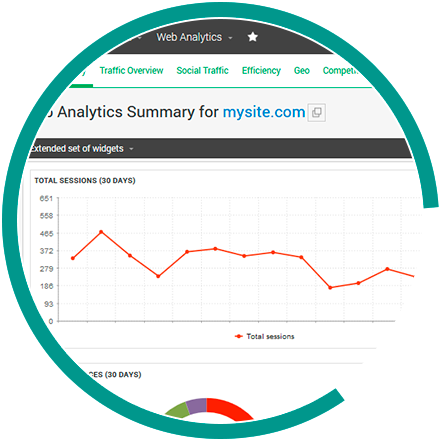 Monitor traffic rank over the last 12 months for your site and competitors too. We include five useful widgets they allow you assess how your business is doing versus the competition fast and with no fuss. Quickly check how your competitors rank on billions of monthly searches, using all the local or global search engines that potential customers use. Find the hidden gems that have not been tapped into and snap up some premium positions. Quantify how many unique visitors your competitors have, are they investing in new customers or existing customers? Assess the relative strength and importance of Social Media Marketing to your site versus your competitors; Compare Social citations for your home page versus those of your competitors. and get real competitive analysis – talk about growth hacks! Backlinking has had some bad press, but make no mistake it is an absolute cornerstone of SEO that generates significant value but you have to get it right. We show you how to get it right and how to fix the bad backlinks that are costing you money. Online Citations, are mentions of your URL or even brand name without a link, it is huge for Local business SEO, not only do they bring direct traffic they can transform your search visibility too. Get mentioned wherever your competitors are and even more places too, we make it easy to get HUGE exposure AND to really STAND OUT from the competition too, the effect can be explosive – Growth Hack!. Prepare Professional standard SEO Reports to clients, customers, investors, shareholders and other stakeholders with your own branding automatically on schedule. 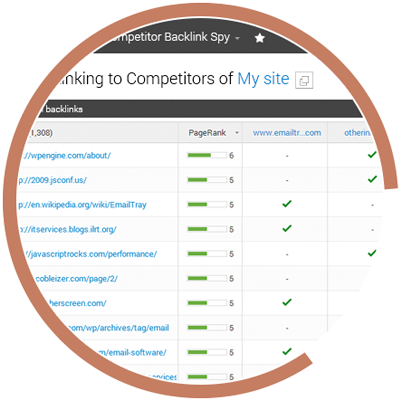 Select up to 10 of your competitors and discover all of their backlinks then reverse engineer the backlink profile of multiple sites, learn their building tactics, catch up fast then outrank them. Research competitor generated content and identify the content that gets the most backlinks (reviews, infographics, how-to articles, etc.). Then you can prioritize generating keyword rich content of the same type to earn more natural backlinks too. The LocalAdworks SEO Platform allows users to schedule the Competitor Backlink Spy report to run on an automatic basis, the run date can be set for a particular day or days each month or according to frequency too such as weekly, fortnightly, monthly or quarterly or on demand too, that way you can be sure that you have up to date competitor information when you need it. Asses the quality of your competitors’ backlinks. Prioritize the links from pages with high Google Pagerank (Google PR) and get the maximum benefits first. Citations have a SEO value that is similar to links, they will help your pages to rank better. Identify mentions of your competitors then contact the site owners, often you can get a valuable citation too. Access professional looking SEO reports that are fully customizable for your own company or agency. Backlinks are one of the foundations for SEO success – start building for online success now! Asses how well your site is doing versus your competitors. Find your competitors’ weak points are and then armed with the information you need formulate a strategy to outrank them. The Google Penguin update meant that the quality of links became important and not just the quantity. Our platform allows you to find all the links to you, assess and segment each according to quality and even helps you to define criteria for “toxic” links using multiple factors beyond simple ” bad neighbourhoods”. These links harm your ranking and cost you money. Don’t risk an unnatural backlink profile, too many links with the same anchor text can trigger the Google Penguin penalty filters or alarms with other search engines, our platform analyzes the anchor text used to link to your site’s pages to keep the profile perfect and alert you if there are any problems so that you can remedy the situation by diversifying backlinks. With our ‘Linking Pages’ SEO report you will get a complete list of incoming links to your website powered by Majestic a premium supplier. Under the ‘Status’ column you can see if a given link is good for your link profile or if it is harmful. You should check your backlink anchor text often, remember there will be a time when new links will start to appear naturally and this may require some active management on your part. The anchor text helps search engines to understand what your site is about, you should review them often, avoid excessive exact matching link texts, unrelated keywords or other spammy techniques. Search engines backlink value algorithms are premised upon diversification of domains so all things being equal a single link from a 10 different domains is worth more than that 10 links from a single domain, and taking it further that analysis is not linear, 100 links from a single domain might be assessed as a negative ranking factor if they represent 50% of your total backlinks. We use the ‘Linking Domain’ report to test whether the linking domains your site is using are diverse enough to prove your website’s authority or whether they are instead harming your website for organic search engine optimization. This is powerful knowledge that you can make great use of. Once you know which pages have the most backlinks you know that these pages are most likely bringing the most visitors and should be prioritized for conversion optimization as well, these pages will have the highest rankings and can be studied to help you improve them, to improve other site pages, they can be replicated with new content and internally linked too. 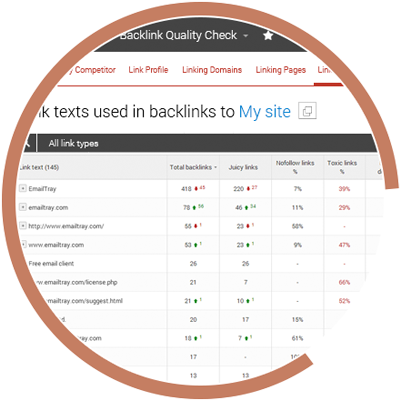 Our Backlink Quality Check widgets allow customers to quickly access backlink metrics like the number of backlinks pointing to your website, the diversity of linked domains, the backlink SEO value and toxicity. Also it’s surprising how valuable your most prized links can be, if something happens to them you need to know as quickly as possible so you can act, so we have made sure that you can configure a Backlink Watch so that you will be notified about any link profile changes immediately. Backlink building has to follow a natural pattern, it takes time so get started now! The Google algorithm update known as Penguin badly affected sites with bad backlink profiles, almost overnight they suffered a huge a reduction in search engine rank and therefore income. The financial effect was devastating and many sites have never recovered their search engine visibility and revenue that they lost. Our platform helps you to remove the toxic links that may attract Google’s attention, recover lost ground and secure your rankings. Our backlink tools are focussed on helping you build a powerful perfect backlink profile, if your site has suffered a Google Penguin penalty, do not get taken for an expensive ride by “internet fixers” simply use the Local Adworks Toxic Links tool, follow the easy steps to methodically remove the unnatural spam links and get the site fixed like the pros do. Use the Localadworks backlink checker to analyze your link profile, check each links quality then deal with any problems with our easy to follow guidance, use the backlink information to update your link building strategy ensure it remains White Hat SEO safe. Examine which sites are linking to you, disavow toxic links easily. How Does the Local Adworks Toxic Links tool help you? Scan your website with the Local Adworks Backlink Quality Checker and then go to the ‘Toxic links’ report. Investigate the potentially harmful links and select the ones you want to remove via the Google Disavow tool. Job done! If are still left with bad links that you cannot remove, then select each links checkbox and click ‘Report selected links to Google’. You will then be led through the Google disavowing process. The Toxic Links report ultimate objective is to clean up your backlink profile and that’s exactly what it allows you to do. Toxicity is a value based judgement and you want to get it right to ensure you don’t remove good links. The Local Adworks Toxic Links tool uses Majestic data which is the best available, then we reinforce that with a special toxicity formula to enable you to detect harmful links easily. Customers can review the details explaining reasons why the link is suspected to be toxic. Once you have decided upon removing the links users can export their list of toxic links and contact each site to request removal of the link. Set the Local Adworks Backlink Quality Check tool to run the backlink profile quality report automatically on a schedule that you choose. This helps to ensure that your website stays compliant with future Google Penguin updates and even gives you a competitive edge when that happens and catches competitors unprepared. Fix your backlink problems and start building a rock solid backlink profile now! + Honing Internal Links The Google Hummingbird update was a major step that introduced semantic search with a more conversational and predictive aspect to the search algorithm our platform helps to hone your internal link flow and the text used to make your site Google Hummingbird Friendly. + Deliver Page Authority to the Pages that Produce the Most Benefit Using our platform you can model your internal link profile to pass link juice to where it will be the most productive, that is to your landing pages that are the best at converting visitors. + Discover Internal Link Building Opportunities Find relevant pages with high authority and then carefully place a link on them to your landing pages to pass link juice improve visibility and increase traffic. + Professional SEO Reports Branded with Your Firms Own Identity Provide professional quality PDF reports to your clients and stakeholders with your own logos and other brand elements. The Link Text Analysis report allows you to see what anchor text is used in incoming and outgoing links on your site. Review all anchor text to make your internal links are content and site relevant, sufficiently diversified and Google Hummingbird friendly. Copywrite like a pro with intelligent interlinking that drives link juice to the important pages for the maximum benefit, get guidance on proper anchor text and avoid link text spamming. Each time you add content, a post or a new page run the Link Text Analysis report and keep everything optimized for success. 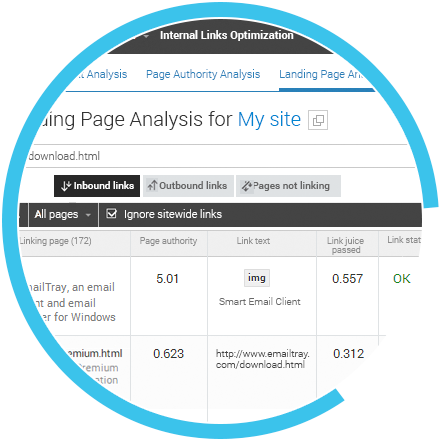 Our Page Authority Analysis report allows you to discover how much link juice your most important pages receive and the anchor texts used in them. Armed with this knowledge you can optimize your internal linking to control the flow of link juice and pass more authority to the pages that convert best. Analyze all landing pages in your site in for internal link building: check how much link juice each page is passing and is receiving and see how much page authority each page has according to search engines. The “Outbound links” tab of the Landing Page Analysis report allows you to identify the pages of your site that are leaking link juice by linking to blocked pages (pages listed in the Robots.txt file or pages that contain the Noindex tag). Review the “Pages not linking” tab of the Landing Page Analysis report to identify each landing page, one at a time, discover any relevant pages that are still not linking to it. Link the these remaining pages to maximise the link juice passed to each significant page. and optimize your internal linking to increase traffic and revenue right now! Get huge exposure for millions of searches with content submitted to more than 90 expertly hand picked search engines and directories. Submit your blog to the most important blog search engines, directories and RSS feeds; join authoritative blog communities and gain high quality backlinks for blogs. Share and Promote your media content like images and videos, slideshows, infographics and white papers on the most popular content sharing sites. What Do You Get with the Local Adworks Content Submission Tool? 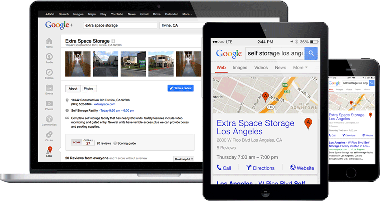 Use or platform to submit your website to over 90 high quality search engines and directories. Use our the automated submission tool for search engines and directories which accept automatic submission and get massive exposure with a click! Get your blog listed on major blog search engines, blog directories and RSS feeds. Participate in blog communities and build credibility as a blogger, generate targeted high quality visitor traffic and earn valuable backlinks. Confirm the success of your content submission using our backlink tools, compare total backlinks, linking domain diversity, the total of .GOV and .EDU domains links and check for nofollow links that pass no link juice to the linked pages against competitors’ metrics. Showcase your multimedia content on over 40 photo and video sharing websites, submit infographic to media directories and blogs, document sharing sites, and more. and get a massive boost to your site’s visibility now! Receive notifications when your chosen keywords (including competitor names) are mentioned on millions forum threads, blogs, microblogs, social networks, bookmarks and other sites with communication functions. Track the ROI on your social media channels. Monitor how often your content is shared, liked or commented on in major social media channels like Facebook, LinkedIn, Google+ and Pinterest. Analyze your competitors’ social activity, formulate a social media strategy and set social benchmarks and targets for your own brand. Discover how much traffic each social media channel is creating and what drives the most conversions, so you can prioritize and optimize your social media promotional activity. 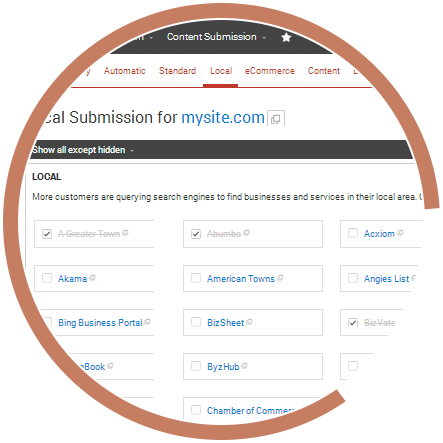 Set the Local Adworks Web Buzz Monitoring tool to search for keywords describing your own niche. Receive notifications of the topics that are trending in your market now. Monitor and report on social activity that links to your landing pages from channels like Facebook, Google+, LinkedIn and Pinterest learn how to hone your social media marketing. Track how effective your own social activity is, and discover how many quality visitors your social media marketing brings and how they convert. Configure the tools with your company name and brand names you want to monitor then use the tool as a online reputation management tool. Identify highly relevant conversations wherever they appear on the internet, participate and add a link to your site where it is appropriate. Add competitors’ sites to monitor their social media popularity. Gain insight into the tactics they employ to assist you in formulating then adjusting your social media marketing strategy. 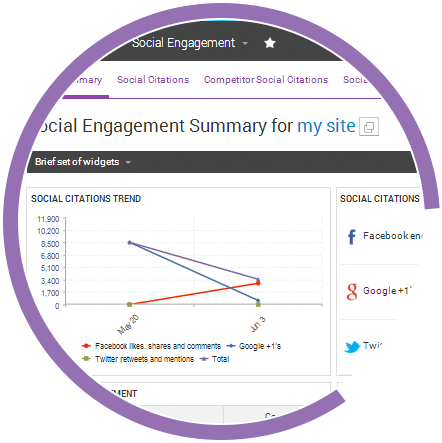 Track the results of your social activity over time with the help of incisive professional SEO widgets. I Would Like to Dominate at Social Media Marketing the Easy Way! and harness the viral power of social media marketing right now!